It’s time again to thank Messrs. ­Carnegie, Frick, Warburg, Vanderbilt, Morgan & Co. The plutocrats of the last Gilded Age left us unfathomable architectural treasures that we cherish and fight over but are still not sure how to care for. They erected houses, museums, and libraries in the form of temples and Renaissance palazzos, great hunks of ornate stone, carved wood, and intricate parquet, anthologies of precious materials and medieval craft. Some have been lost; touch what’s left and we get angry, alter them and we despair. As Manhattan keeps remaking itself, one shuttered shoe-repair store and vanished brownstone at a time, these ornate piles endure—the Frick, the Cooper Hewitt, the Public Library, the Metropolitan Museum, each with its tribe of passionate loyalists. None of them is pristine. From the beginning, they experienced decades of fitful renovation, and their occupants still keep bursting through walls. There’s never enough space. Some institutions wear their history more lightly, or have the luxury of starting fresh. The Whitney will soon move into a brand-new building, and MoMA keeps knocking down anything that sits in its expansionist path. But most museums have to keep adapting to their old homes. They build additions and gut interiors to accommodate ever-expanding crowds and collections, and every time a fluted column or pedimented doorway gets in the way of a future gallery, the same problem crops up: how to make a grand old building more rational and efficient without neutralizing its ­idiosyncrasies—how, in other words, to make it better without ruining it completely. The one certainty of adding to a beloved Beaux-Arts monument is that most people are going to hate it. In 2001, when Davis Brody Bond slapped an ungainly glass-fronted appendage on the side of McKim, Mead & White’s Harvard Club on West 44th Street, the club’s members mutinied in court. They lost the legal fight, but they were morally justified; the new structure has aged as badly as your high-school haircut. In 2006, Renzo Piano applied a similar technique with more finesse, and more justification, at the Morgan Library & Museum, though that renovation, too, still has some people foaming in fury. Piano tied together an eclectic collection of historic buildings (a Victorian brownstone, J. P. Morgan’s baronial library by McKim, Mead & White, and a 1928 annex) with modernist connective tissue, all pure lines and clear glass. Blunt contrast like that is the default strategy for expanding Beaux-Arts buildings, but it’s not the only option. At the other extreme, in 1993 Kevin Roche doubled the size of the Jewish Museum with a tour de force of camouflage. Borrowing stonemasons from the Cathedral Church of St. John the Divine and limestone from the same quarry that furnished the original mansion, Roche copied out the frippery with the devotion of a Torah scribe. The Frick wants to take that approach, too. Having defiled the Harvard Club, the architects at Davis Brody Bond now hope to add subtly and seamlessly to the existing Frick, making it look like a magnified mansion—the same as before, only bigger. That sleight of hand collides with a first principle of preservation: that the lines between historical periods should be clear. What the Frick urgently needs is a third way, somewhere between slavish reproduction and slavish opposition. There should be a modern equivalent for the craftsmanship, detail, and luxury materials of a century ago. The problem is, there isn’t. To understand why we’re left with those two extreme but equally lackluster options—and why it’s so difficult to come up with a third—it helps to rewind to the late-19th century, when American architects gravitated to Paris’s École des Beaux-Arts, a palatial complex on Rue Bonaparte that served as the incubator of official French aesthetics. The Beaux-Arts tradition was old-fashioned even then, a ­backward-looking discipline that both called to and irritated impatient American architects like Louis Sullivan. It treasured classical elements, refracted through the French and Italian Renaissance. Essentially, the school taught its students to produce refined knockoffs of knockoffs. But the school was not just about a repertoire of ornaments and proportions; it offered a way of shaping society through architecture. Graduates aspired to design civic monuments, libraries, universities, government buildings, and temples of culture—the locomotives of modern life. Medieval Paris had grown in a tangle around Nôtre-Dame; the modern city converged more rationally on its own cathedral, the opera house. Today, though opera as an art form is no longer a social unifier and Paris’s old house has been upstaged by a newer one at Place de la Bastille, the immense, ornately costumed Palais Garnier stands in the urban spotlight, a grande dame who refuses to recognize that her time has passed. In New York, it was the industrial aristocracy that commandeered Beaux-Arts ambitions, building theatrical palaces that doubled as seats of power. The Vanderbilt family erected a row of mansions hip-to-flank along Fifth Avenue between 51st and 52nd Streets. When the patriarch, William H. Vanderbilt, completed his in 1883, he flung open the doors and an audience of 2,500 came to gawp at its gaudy marbles and carved ceilings, an opulent setting for a heroic capitalist life. Virtually at the same time, Richard Morris Hunt (architect of the Metropolitan Museum and also the first American to attend the Paris mother school) was building Vanderbilt’s son ­William K. a French Renaissance mansion next door. This composite château for the ages lasted less than 50 years. The Beaux-Arts aesthetic was by definition expensive. If you’re going to advertise a client’s fortune or a city’s greatness by merging modern technology with ancient motifs and stained-glass ceilings, carried out by scores of carvers, mosaicists, gilders, and bronze-casters, you’re not going to do it on the cheap. Even cozy rooms were meant to impress with their lusciousness and perfection. Walls were not just paneled; they were sheathed in mahogany carved in India. People surely went blind fashioning those curlicues. As the Gilded Age ebbed, that fussy splendor seemed increasingly out of joint in a democratic, optimistic society. Every move toward modernism was a step away from historicism. Severe skyscrapers, industrial-age proportions, a craving for simplicity, and the fetishistic appeal of glass, concrete, and exposed steel turned stone angels and Ionic capitals into faintly ridiculous affectations of the past. Generations of architects were trained to reject the Beaux-Arts, and we lost the knack for its ordinary extravagances. New York’s own Gilded Age opera house, with its flamboyantly grand interior, was torn down in 1967 and replaced by the austere one at Lincoln Center. Terra-cotta, originally an affordable and more malleable alternative to hand-carved stone, more or less went out of production around the same time, and a lot of glazed tile façades were left to streak and crumble. The Frick expansion plan by Davis Brody Bond. Photo: Courtesy of Neoscape Inc. In the midst of Gilded Age II, architects are cautiously trying to resurrect early-20th-century textures here and there, with fitful success. Robert A.M. Stern lavished limestone on his throwback condo building at 15 Central Park West. Terra-cotta is getting a new life as a deluxe trim, used sparingly in ultrahigh-priced apartment buildings to set off acres of glass. And in the new Sugar Hill ­affordable-­housing complex in Harlem, David Adjaye tried to emulate that olden handmade texture by etching a digital pattern of roses into the façade’s concrete, an abstract, ghosted version of the hand-tooled thistles and ornamental vines that adorn the genteel neighborhood’s brownstones and cornices. Adjaye managed to produce only a crude upholstery pattern rather than a fantastical evocation of Eden, but it’s hard to blame him. Laborious stonework, fanciful wrought iron, and all the other practices that once cast shadows and conjured flickering drama on a building’s surface are now practically extinct, not just because of high costs and low skill but because our culture doesn’t value them. You can exhume these extravagances every once in a while for restoration projects (or for Roche’s Jewish Museum one-off), but otherwise the city is going shiny, simple, and smooth. That’s one reason we get so many glass-box additions. The best consolation for ignorance is to turn it into a rule. By now, most Beaux-Arts buildings are architectural Frankenstein’s monsters, having grown new limbs and internal organs and had various portions sawed off over the decades. All that tinkering has left an uneven legacy of splendor and scars. The New York Public Library restored the spectacular reading room in its Fifth Avenue headquarters in 1998 (Davis Brody Bond again!) but recently had to close it again after a rosette detached from the ceiling in the middle of the night and plummeted (harmlessly) to the floor. But that’s the least of the building’s problems. Wander around the back-office space and, while the high marble hallways and battered wainscoting retain a certain disheveled dignity, other rooms have degenerated into a purgatory of fluorescent tubes, dropped ceilings, and rotting linoleum. The library has scrapped its plan to scoop out the stacks and implant a new circulating library, but it’s still developing a strategy to turn underused and off-limits acreage into public space—a huge and potentially transformative job, but oh, so easy to screw up. Different institutions grow in different ways. The Frick keeps collecting clocks, small bronzes, and porcelain. The Met adds to its stock of modern and contemporary art, for which it needs more rational gallery space. The Cooper Hewitt is embracing the connective power of technology; it will reopen in December after an extensive overhaul by Gluckman Mayner Architects (and others) that has bared the beauty of its most voluptuous room, transformed the more utilitarian top floor from nursery-gym-storage to a big, flexible gallery, and rewired the whole space for the latest in interactive doodads. On a recent preview tour, you could sense the curators’ lust for plain walls, track lighting, fresh parquet, and ample elevators. A curator can offer no greater architectural praise than to describe a room as “neutral.” The crucial feature of the renovation, though, is not a building but a product, an electronic pen that will be issued to all visitors so that they can redraw the world to their liking, like Harold with his purple crayon. They can use it to scan labels, save images of the items they choose to a personalized database, scrawl notes and sketches on touchscreen tables, and create their own wallpaper that gets multiplied and projected onto two full walls. In the demo, all this threatens to come dangerously close to gimmickry, but perhaps it will be revelatory in real life. The Frick faces an even more extreme challenge, slipping a new six-story wing into its existing space without making the museum feel any bigger. Visiting Henry Clay Frick’s old mansion is like being invited to join the family for an intimate affair. You drift through his rooms, which are still filled with his furniture, and introduce yourself to another guest, Holbein’s Sir Thomas More, say, who stares past you, looking a bit thuggish with his five o’clock shadow, fierce eyes, and daggerlike nose pointing to some unseen interlocutor. The Frick’s galleries are the opposite of contemporary neutral; they enfold the art in a domestic atmosphere, making each object seem like a possession that its owners have deeply loved. That intimacy is fragile. It shattered last winter, when an exhibition of masterpieces from the Mauritshuis (including Vermeer’s Girl With a Pearl Earring and the suddenly famous The Goldfinch) drew intolerable crowds, turning art viewing into a contact sport. Enlarging the museum could harm it, but that doesn’t mean it shouldn’t be tried. 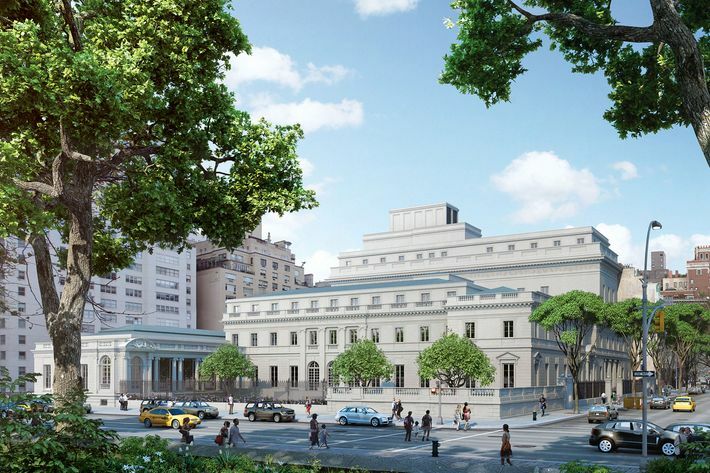 A new annex would not turn the Frick into MoMA; rather, it would let the museum draw back the velvet rope that has always kept ­visitors from climbing the theatrical staircase to the unseen, splendid second-floor rooms, now used as offices. Besides, the Frick is already a mishmash of tasteful imitations. In the 1930s, John Russell Pope, an impeccably pedigreed Beaux-Arts classicist, expanded the original Carrère and Hastings mansion, adding the gracious oval gallery and Art Reference Library, covering the central courtyard, smoothing the seams, and hewing to the masters’ habits of ornament and proportion. 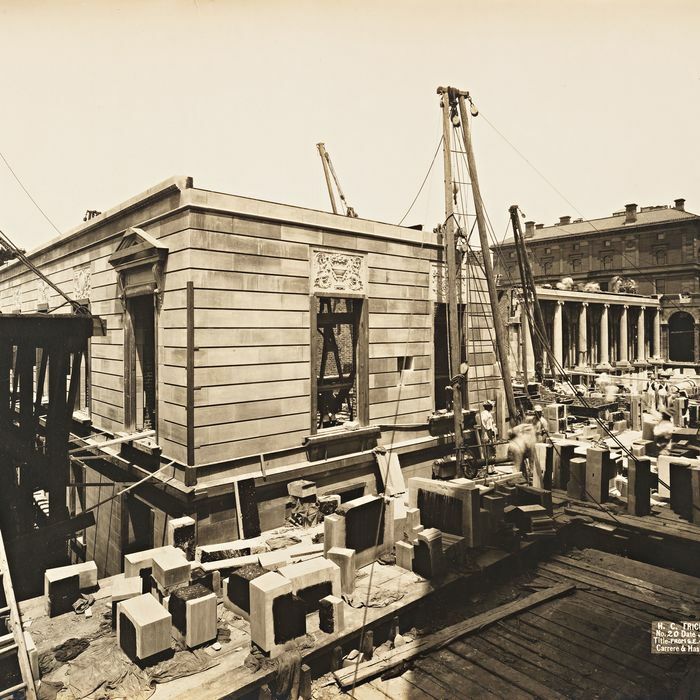 Forty years later, a trio of architects—named, with Gilded Age grandeur, John Barrington Bayley, Harry van Dyke, and G. Frederick Poehler—contributed the long, egg-yolk-yellow ticket hall to the right of the main entrance, a nice bit of fakery that few visitors can ever have questioned. Through the French doors is a delightful slice of a garden wrapped around a rectangular lily pond, designed by the distinguished landscape architect Russell Page in 1977. The new scheme would destroy it. The Frick has a right to grow as it ages, and a record of graceful surgery. But it would be a mistake to expand into another bogus Beaux-Arts creation, a knockoff of a knockoff of a knockoff. The Landmarks Preservation Commission has jurisdiction here, and it should demand a more creative proposal. For precedents, there’s Annabelle Selldorf’s 2001 renovation of the Neue Galerie, an exquisitely sensitive mixture of faithfulness and freshness. Selldorf didn’t have to build a new wing, but she cut, set, and buffed the interior spaces with a jeweler’s delicacy. She paired a ravishingly spare elevator with an ebullient curving stair and faced it in white glass. She recessed track lighting in high-­ceilinged antique rooms, covered the floors of new galleries in somber oak planks, and turned the paneled dining room into an evocative Viennese café. The renovation twines together vastly different periods, not in an eclectic jangle but in delicate counterpoint. It’s an example that suggests a compromise between retread and plain glass box: a sumptuous blend of freshness and respect that by now should have set the standard, not remain the admired exception.